Why should we assume that every scientific discovery has come through us? Srinivasa Ramanujan was a jukebox of contradictions. You could tease out whatever trait you wanted to see in him. He was steeped in religion and tradition, yet defied them to cross the seas to reach England. But even there he remained stubbornly rooted to tradition for his own good. He successfully pitted his wits against the established order in the world of logic, rationality and proof. But he attributed all that prowess to the illogical, irrational and the unprovable. A still from The Man Who Knew Infinity, a film based on the life of mathematician Srinivasa Ramanujan. His life has been studied by many and documented in books, plays and movies - more recently in The Man Who Knew Infinity and earlier in the Tamil movie, Ramanujan. His poverty, struggles and the colonial context have been understood well: "A poor and solitary Hindu pitting his brains against the accumulated wisdom of Europe," as his mentor GH Hardy describes it. But nothing explains the mystical side to Ramanujan's personality. Yes, the mystical side. I'm not sure if another term comes this close to describing it. Incidentally, this is one of the themes presented beautifully on screen in both the English and Tamil versions. Hardy, who is a strict atheist and rationalist, is at odds with himself when Ramanujan says that the Goddess Namagiri Thayar appears in his dreams and reveals theorems to him. This is one the facets of Ramanujan that intrigued me a lot. It still does. The last word on this is usually his statement that an equation to him had no meaning unless it expressed the thought of God. And that is that. But this tug-of-war between science and religion does not begin and end with Ramanujan. Much of modern science comes down to us from the phenomenal strides made in Europe since the Renaissance. The field of study was not even called "science" in those days. The term people used was Natural Philosophy. Very little is known about what Europeans were up to in the Middle Ages to the extent that the period was dubbed the Dark Ages. But once they emerged from there into the Renaissance era, they wanted to understand God's creations and their characteristics. They wanted to uncover the rules of behaviour that God had put in place for his creations, that is, God's will. And the result was a new push in the field of Natural Philosophy. Much of this exploration by natural philosophers was actually encouraged and promoted by the Church. They believed that the knowledge of God's rules will keep human beings moral and supported the intellectual pursuits of natural philosophers for centuries. The physical laws of the universe were discovered as a result of their work. Only when the findings of these natural philosophers started going against long-held beliefs and doctrines did the Church started having second thoughts and we started seeing the persecution of luminaries like Galileo. Isaac Newton, the father of modern science, too devoted a lot of his time and energy to religion, occult and the interpretation of the Bible. Over the years, I came to understand some of this history better and it started looking less bizarre that Ramanujan too saw a direct link between God and his mathematical theorems. Ancient Indians were even more extreme, going back two millennia before Renaissance. To them, the Gods demanded a great level of precision in every single aspect of their daily life. Every step they took since waking was a rite. Heck, even the act of sleeping and waking was a ritual governed by certain rules of behaviour put in place by God. When it came to the act of pleasing Gods with offerings, the precision required of them was at microscopic levels, from the way offerings were to be made, to the way each syllable of the mantra had to be intoned, to how accurately the fire altars had to be laid out and constructed. This finicky obsession with precision led to some mathematical discoveries which unintentionally ended up having a lot of value in the modern era. 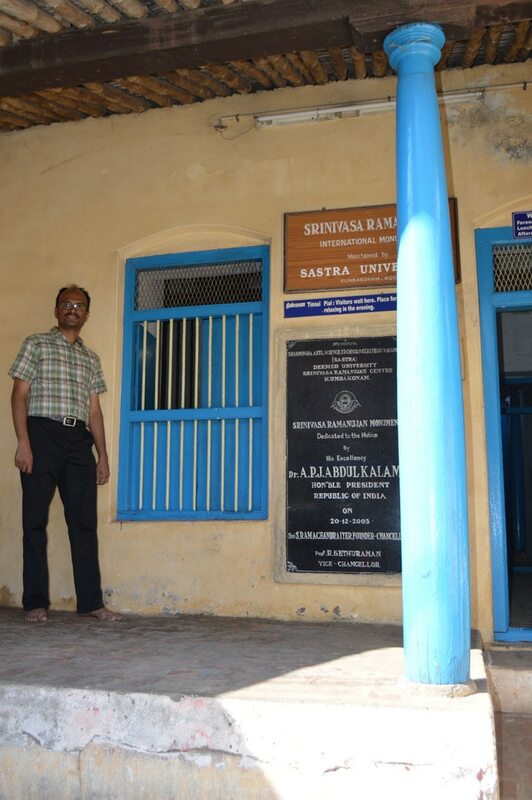 The author at Ramanujan's childhood home in Kumbakonam, where the mathematician discovered hundreds of theorems. Having discovered this, a barrage of questions battered my mind: why should we assume that every single one of these scientific discoveries has come through us? What if some of them still lay undiscovered somewhere in India? What would be their implications if they were discovered now? How big an impact would they make? What if some of them fell into the hands of the wrong people? What havoc could that unleash onto the world? And how could people stop that? A mystery-thriller novel formed a perfect medium to explore and share some of these ideas and to get answers to some of the questions. There are several secrets to be uncovered and several stories to be told. But Ramanujan and his work provided me with the perfect anchor for the first story - no, the zero-th story - and kicked things off. And the result is The Steradian Trail, which is the Book#0 of the Infinity Cycle. A big challenge I faced was to make sure the story was gripping from the first page on and the ideas were made accessible to all readers without weakening their substance. It took several years of effort and I think I have largely succeeded there. The book has been loved by general fiction readers and critics, as well as internationally respected best-selling authors like Apostolos Doxiadis and Guillermo Martinez whose praise I wear like a badge of honour. Author of The Steradian Trail: Book #0 of the Infinity Cycle.